For now 56 years, the Honorable Minister Louis Farrakhan has been serving our people on a national and global scale unlike any leader that is on the scene today. No leader has a track record such as his and there is truly no amount of money that can equate to what he has and is doing. I personally bear witness. I notice every time Black History Month comes around, he and his father, the Most Honorable Elijah Muhammad, get overlooked by the so-called intellectuals, schools, etc., as if they have done nothing in the advancement of our people--not only in America but throughout the world. Frankly, Black America and really the world owes a big debt of gratitude for what they have done and continue to do. This is why I love to give to the annual Saviours' Day gift, which is presented to Minister Farrakhan as a small token of our appreciation. I feel that if rappers, politicians, and athletes can be supported without doing nothing for our people, then surely it is proper that we give to a man like Minister Farrakhan--who has elevated human beings to a higher expression of their God-given abilities. I personally bear witness. The Nation of Islam is presenting its 2011 live Web - A - Thon to help raise funds for the annual Saviours' Day Gift on behalf of Minister Farrakhan. The Web A Thon, Tuesday, February 8th, 2011 at 7:30 P.M. CST. The fund raiser will be conducted simultaneously from Nation of Islam Mosques and live streaming webcast @ http://www.noi.org/webcast/. You can make your donation by clicking on the "DONATE" button on that link. 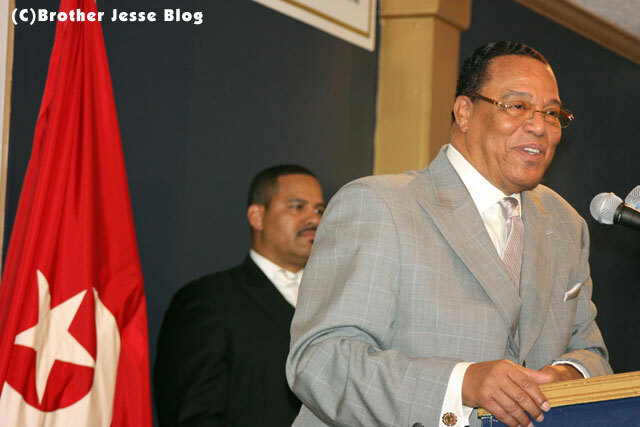 2/8/2011 at 10:10PM CST: The Nation of Islam just concluded its 2011 Web A Thon for the Saviours' Day Gift. The energy on the screen from the various cities was high. It got even higher when the viewing audience received a surprise message from the Honorable Minister Louis Farrakhan live from Phoenix, AZ. He said in part, "I am grateful for each and everyone of you--and for all you sacrifice to help in this great cause. Words are really not adequate to tell you what I feel in my heart." Minister Farrakhan then spoke about the Nation of Islam. "The Nation of Islam must return to its root--its root in Him Who Came. We cannot go forward until we go backwards--and look deeper into what the Saviour (Master Fard Muhammad) gave us...We have alot of work to do--alot of studying to do," he said. Minister Farrakhan also stated how excited he is about the upcoming Saviours' Day plus he announced that the album that he has been working on the past 8 years is just about complete. He said it features Chaka Khan, Stevie Wonder, Snoop Dogg and others. This was the 2nd Web A Thon, which is the brainchild of Student Natl Secretary Berve Muhammad. Tonight he ran a clip showing the construction that is happening in Chicago in preparation for the grand re-opening of the Salaam Restaurant. We also heard words from Student Minister Jeffrey Muhammad, Student MGT Capt. Sandy Muhammad, Student Supreme Capt. Mustapha Farrakhan and Student Min. Ishmael Muhammad. We also saw live feed from various Mosques around the country as they announced the amounts they raised for the Saviours' Day Gift tonight. The totals ranged from $8,000 - $80,000! Amazing show of love for Minister Farrakhan. If you're in Twitter, check the hashtag #SD2011 for more highlights.